"Mike's railroad - Depot Street - Page 2"
The street begins with the "Brian Brook Railroad Depot" and it introduces arriving passengers to the Village Business Center. The business center provides Shops with the goods and services. Street side parking is provided with additional parking shared with the passenger depot. Depot Street ends with a 4 track stub end Passenger depot. The passenger deport provides for parking in the front while sharing overflow parking used by shoppers. Please note: As you walk along Depot Street you will see that many of the shops are incomplete. 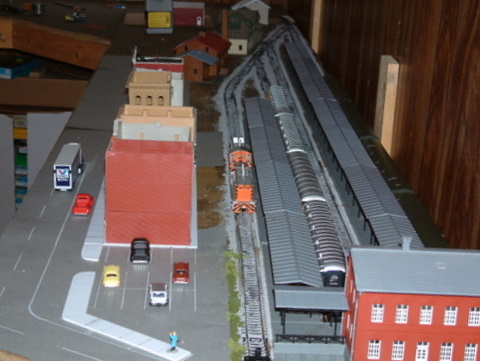 The construction of the layout has been an ongoing process for several years with many more years yet to go. So, many of the structures will be missing a roof and the store fronts will appear to be empty. There is a lot of work that has yet to be done. -- Thank you for your patience. Depot Street: The "Long View"
This is one of the first views of "Depot Street". It is the first thing a visitor will see upon approaching the train room. This photo was taken in February 2010 and a lot of work has been done to fill the street from the stub end passenger depot to the Fire and Rescue station. Most of the building do not have roofs placed on them as of yet. I'm leave the option of interior detail and lighting. The links provided on the left side of the page will take you directly to the business that interests you. Brian Brook station was named after my son Brian. On an earlier version of my railroad this was an "Online" station rather than a stub end depot. Practical considerations in the railroad room forced me to make the necessary changes that you see here. 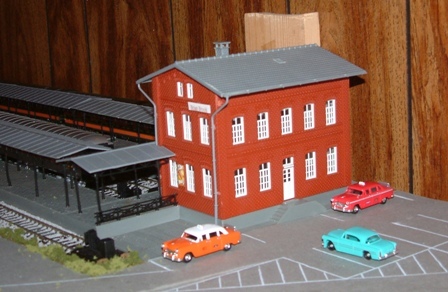 The depot has it's own parking facilities and taxi parking in the front of the building. Overflow parking is accommodated by the business parking lot adjacent to the railroad property. 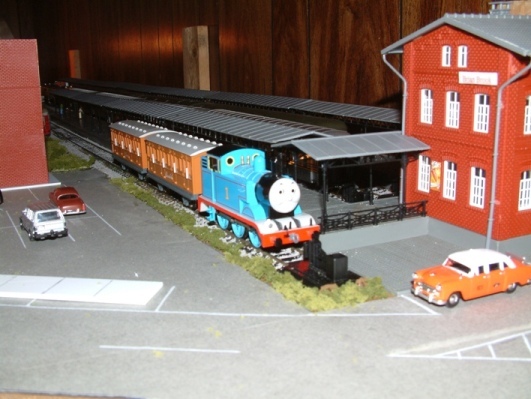 Thomas the tank engine is on display at the Railroad depot. 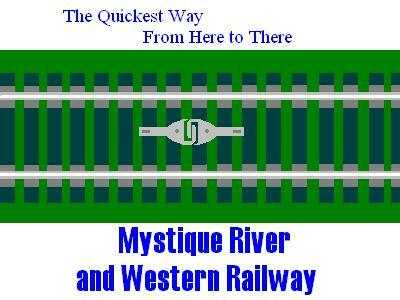 He frequently makes visits to his friends on the Mystique River and Western Railroad. Always popular with children, Thomas has proven to be a great Public Relation Representative, and a boost for the local economy. A "Party Atmosphere" always seems to surround him where ever he goes and his visit to the village is no exception. Please stop by and say "Hello" to Thomas and all of his friends. The Business District - Part 1"
This is the "First Business District" because it was the first to have permanent building assignments. 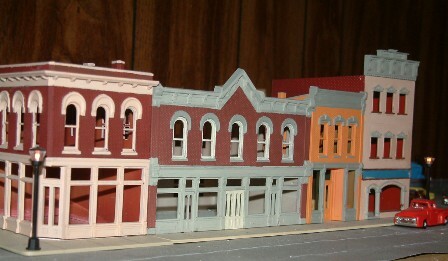 As the building of the railroad progresses, store interiors will be added. As you make your way along Depot Street from the passenger terminal, you pass the parking facility (at the far right) and several stores starting with an Ace Hardware, and ending with the corner store on the left. Also notice that depot streets business section has had it's street lights turned on. The Business District - Part 2"
This is the center of the business district on Depot Street. 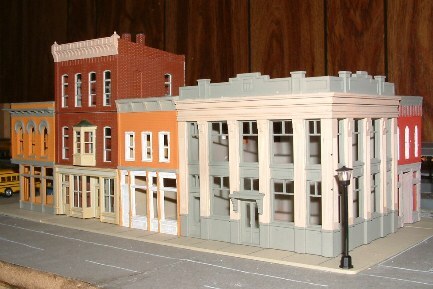 At the corner of Depot and 5th street stands the "Village Savings and Loan Bank". Like a lot of small towns, small business grew around the center of financing. All of the building follow different construction methods and style. This is true from the corner store on 4th street to the small shop located behind the bank on 5th street. 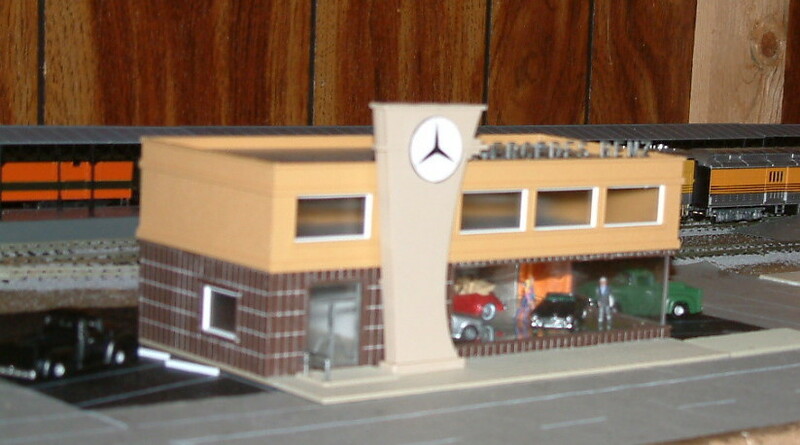 The Mercedes-Benz Dealership is one of the major businesses located in the Northwest corner of Depot Street. It is a new business that was attracted by the developing business opportunities that have developed over the years. As of this date (9/1/2011), this is the only building that has been completed to the point where the interior showroom has been lighted. 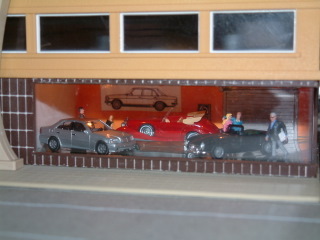 It shows the dealership manager, a young couple contemplating a sports car and along the back wall, a salesperson closing a deal with a seated lady at the salesperson's table. 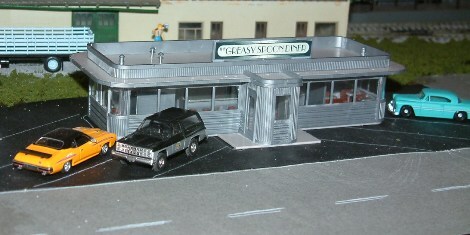 The Greasy Spoon Diner is an old family restaurant business. Passed down to the present owners, the business was started by the current owner's grandparents. It has been a stable of the community, and has seen countless changes to the village throughout it's many years. With New York Style hotdogs and hand patted hamburgers to the finest Italian dishes this little restaurant has been able to please the hungry crowds for generations. Whether you are a fancy businessman out to please a client or a hungry police officer stopping in for a quick lunch, "The Greasy Spoon" is sure to please all of your culinary desires. The Village Fire Department was placed between the Commercial Business District of Deport Street and the industrial facilities at the LaFayette Locomotive Shop. 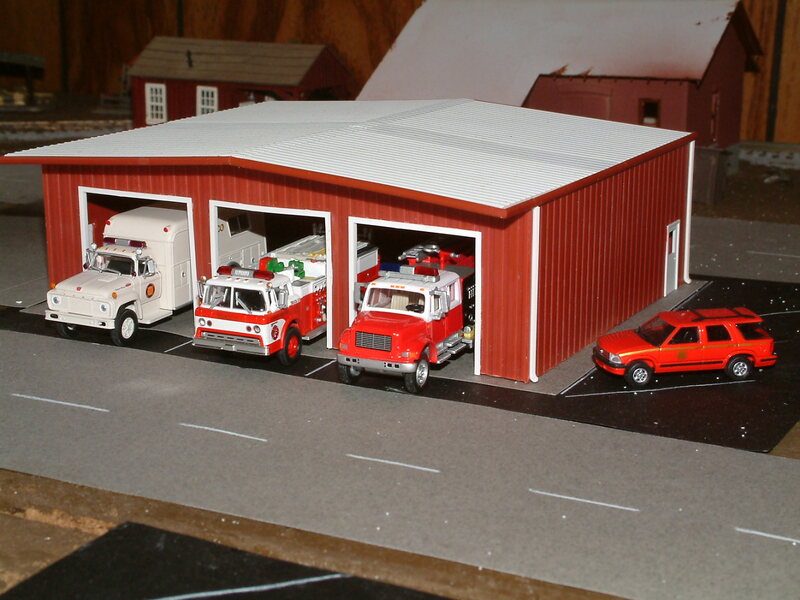 This fire station contains and EMS ambulance and two fire engines in three bays. Each presents the the readiness for dealing with a fire or meeting the demands of a medical emergency. Depot Street ends at First street. Support industries for the Village Business District and the railroad are there. More information for 1st street can be found on the First Street webpage.